Our nervous system allows us to think, feel pain, heat, cold etc. and to have a reflex action to certain stimulus. Without our nervous system, we could not survive. It is one of the fundamental life processes. Largely, organisms can be divided into those which have vertebrae, and those which don’t. We will be talking about those which have vertebrae in this article. The organisms included in this group are of the Phylum Chordata, such as humans, cats, dogs etc. The cells associated with this fundamental process are neurons or nerve cells. These are long cells which transmit nerve signals. These are also the longest cells in the body. The signals are sent rapidly through the thin axons in the form of electrochemical waves. This leads to the release of neurotransmitters at the junctions of nerve cells, known as synapses. This leads to the formation of a neural network, which helps us utilize the nervous system. Nerve cells can reach every cell in the body and receive a reply. This is a very quick process. 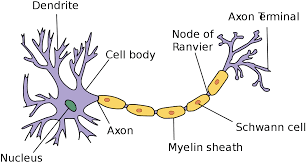 The nerve cells consist of a long thin fiber known as axon, which is wrapped by myelin sheaths. This not only speeds up the nervous system but also acts as an electrical insulator. These sheaths have gaps, and two sheaths are connected by the nodes of Ranvier. These nodes help in flow of ions, which in turn speeds up the process. At one end of the neuron, are the axon terminals, which receive the signal to be transmitted. At the other end is the cell body. The nucleus is also there, including dendrites which actually help in giving out the signal, so it can be transmitted further. Another type of cell associated with the nervous system is the lesser known glial cells. Glial cells do not transmit signal, but are there for the support of the neurons. They also provide nutrients to the nerve cells, act as electrical insulators, remove any pathogens and dispose of dead neurons. A very unique glial cell, oligodendrocytes (CNS) and Schwann cells (PNS) create myelin that covers the axon of the neurons in sheaths. There are about as many glial cells as there are neurons in the brain, but their concentration in various areas in different. 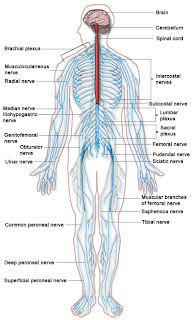 The main two parts of the nervous system are the CNS and PNS. The CNS (Central Nervous System) consists of the brain and the spinal cord. 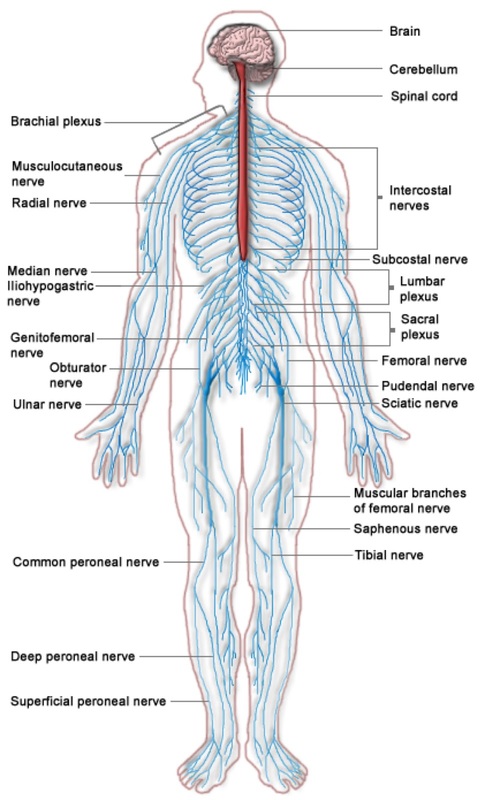 The PNS (Peripheral Nervous System) consists of a bundle of neurons that connect to every part of the body. Therefore a message sent by CNS can arrive at any place in the body through PNS. Let us take an example. If we want to lift our finger, the CNS gives an order to lift the finger. The order is transmitted through the spinal cord and further through the PNS. The order transmits from dendrite to axon, and finally reaches the finger. There, it gives an order to finger muscles to contract or relax. This may seem like a complicated process, but it is all done in an instant. Let us discuss about the human brain as a final topic now. The brain gives us the ability to think, and interprets signals from various parts of our body to give us the abilities to see, touch, hear, smell and taste. It also moulds our personality and decides how we react to physical and emotional stimulus. It size is just 1260 cm3 for men and 1130 cm3 for women, and it weighs around 1.2 – 1.4 kg. It accounts for 2% of our body weight. The human brain is protected by the skull, and is one of the essential organs in the human body. The brain has two hemispheres: Right and Left. It also consists of three parts: the cerebrum, cerebellum and brainstem. 1. Frontal lobe – It controls personality, emotions, behavior, body movement, judgment, speech, intelligence, concentration and self-awareness. 2. Parietal Lobe – It controls vision, language and words, touch, pain, temperature, hearing, motor, sensory, memory and spatial and visual perception. 3. Occipital lobe – It controls vision, it interprets the colors, light and movement. 4. Temporal Lobe – It controls language, memory, hearing, sequencing and organization. 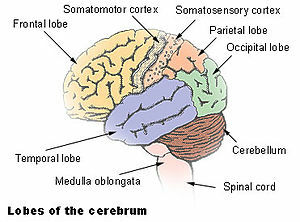 The cerebellum is the part of the brain which controls muscle movement, maintains posture and balance. This may seem like less work but if you think about it, these are extremely important functions. The brainstem connects the rest of the brain to the spinal cord. It controls our basic functions such as breathing, heart rate, sneezing, vomiting, swallowing, body temperature, wake and sleep cycles etc. The Right and Left Hemispheres perform almost the same functions, but have some independent functions of their own. 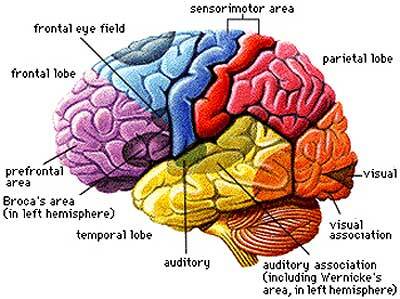 The Left Hemisphere controls the right side of the body and the Right Hemisphere controls the left side of the body. The Left Hemisphere also controls hand use and language in about 92% of people. The Right Hemisphere controls creativity, artistic skills and musical skills.